As The Legend of Zelda: Symphony of the Goddesses continue to tour around the world, they’ll be arriving on the sunny island of Singapore for their first ever performance in Southeast Asia. Running for 5 years, the symphony has constantly changed and evolved with the ever popular video game franchise, The Legend of Zelda. Lucky for us, we got to ask the symphony producer, Mr Jason Michael Paul, a few questions on his thoughts about the long running, world touring symphony. NintendoSoup: I believe this is the first time the Legend of Zelda: Symphony of the Goddesses will be performing in Southeast Asia and Singapore, what influenced the decision? Jason Michael Paul: This is indeed the first time performing The Legend of Zelda: Symphony of the Goddesses in Singapore and Southeast Asia. I have performed other VGM concerts with PLAY! A Video Game Symphony and I was very encouraged by the fan response so I assume that there is a strong Video Game community there. I am also keen on taking Zelda Symphony to everywhere in the world! NS: Zelda is a time-honored franchise spanning over 30 years. Within that span, there are probably two generations of players. Everyone in the audience comes in with different experiences of the franchise, having played or started from different games. How hard is it to cater to the diverse crowd? JMP: We strive to create a concert that can be appreciated by all types of people. You don’t even have to be a Zelda fan to appreciate the concert. It is my opinion that the music stands on its own with the visual accompaniment. However, the visuals definitely help to guide you on this journey through Hyrule and only help to further tell the story of The Legend of Zelda. We are pleased to present a show that is something for everyone. Especially, the fans of the series no matter what generation they represent. NS: The Legend of Zelda: Breath of the Wild (BoTW) has exchanged a lot of huge in-game musical pieces to subtle sounds of nature. What do you think of that? JMP: You will soon see and hear what we have done with the new Breath of the Wild (BoTW) music. The new game has enabled us for the first time to incorporate subtle sounds of nature along with orchestral music in a live concert environment. I believe it is done just right. You will hear all the sounds of nature along with a beautiful arrangement and visuals that will tantalize the senses. NS: The Legend of Zelda: Breath of the Wild main theme also uses a couple of oriental instruments such as the erhu and bamboo flutes during recording. I understand that Breath of the Wild music will be making an appearance in it, will those oriental instruments be making an appearance? If not, was it easier to transition them to fit the symphonic band? JMP: We will be mimicking the sounds that you speak of using our existing instrumentation. 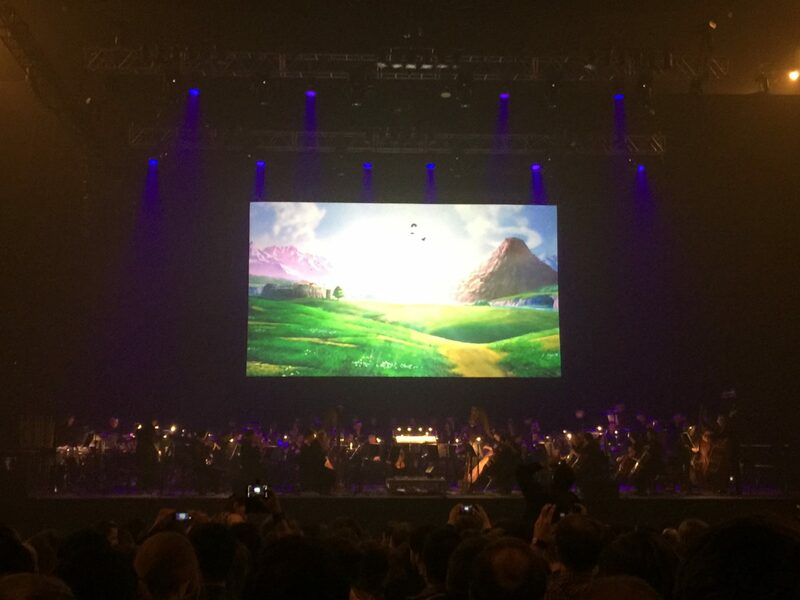 New music from BoTW is definitely an exciting addition to an already packed concert that features new music from not only BoTW but also a new movement from Skyward Sword, Ballad of the Windfish, and so much more. NS: What is your favorite Zelda Game and piece of Zelda Music? JMP: That’s a tough question. It is difficult for me to pick a favorite. Right now I am playing BoTW on Switch, and before that, I was playing Skyward Sword again. I love Ocarina of Time (OOT), Majora’s Mask (MM), A Link Between Worlds (ALBW), Twilight Princess (TP)…. I guess that doesn’t really answer your question. Perhaps Skyward Sword resonates with me greatly because I had the pleasure of producing the Orchestral CD that was released as part of the bundle with that game. It was truly an honor. NS: Having produced many Game music concerts, with each game and their music having a distinct flair, how would you describe Zelda’s distinct flair. JMP: No comparison. This concert’s music is in a league of its own. This is my proudest work. The plays wonderfully in an orchestral concert hall and I have had the honor of serving Nintendo since the creation of the concert back in 2011. This concert iteration is the best yet. NS: How will you rate Nintendo’s involvement in the performance? JMP: They are involved to the extent that they approved and license the music and visuals. Everything has to go through them. NS: Are they very restrictive creative wise, or is the team free to explore new ideas? JMP: We have autonomy when it comes to the creation but ultimately it is up to Nintendo to approve or disapprove. We have been pretty lucky so far I guess with this process. NS: Another Nintendo Franchise with multiple pieces of Symphonic music is the Fire Emblem Franchise, any interest in turning it into a full symphonic world tour? JMP: I would be honored. I have some other projects that I am currently working on but this is something that I am definitely familiar with. Fire Emblem’s music is definitely something to be reckoned with. We will like to thank Mr Jason Michael Paul for taking time out of his busy schedule to answer our questions. 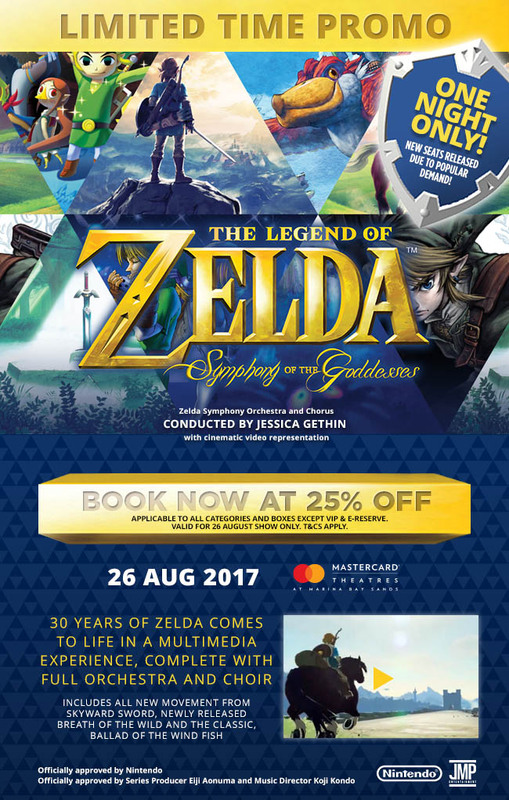 The Legend of Zelda: Symphony of the Goddesses will be playing at the Grand Theatre, Marina Bay Sands, on the 26th August 2017. If you have yet to get your tickets, you can get them here at 25% discount.